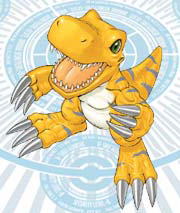 Digimon Chronicle Japanese. After much research on "agu" I believe it's short for agurabana, which means a wide, flat nose (which describes Agumon pretty well). X because he was modified by the X-Antibody.